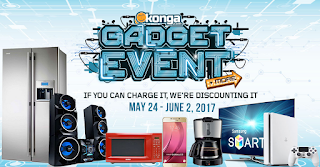 Konga.com has just launched the biggest Gadgets sales event of the year, prices are extremely low and we believe this should be great. This event occurs every year with massive discounts on all products that can be billed. The best brands such as Binatone, Haier Thermocool, Hisense, Infinix, Partner Mobile, Scanfrost, ZedAir and many more will be available at unbeatable prices. The event will run from May 24 to June 2, 2017 and will include high-end gadgets such as laptops, mobile phones, televisions, freezers, washing machines, and more. The Konga Gadget Sale responds to all and everything you might need in all categories and pocket sizes. So if you can reload it, we update it definitively. Always remember that on Konga, superior quality is guaranteed as well as prompt delivery. Do not miss the Biggest Gadget sale event of the Year. Share this article to inform friends and loved ones.